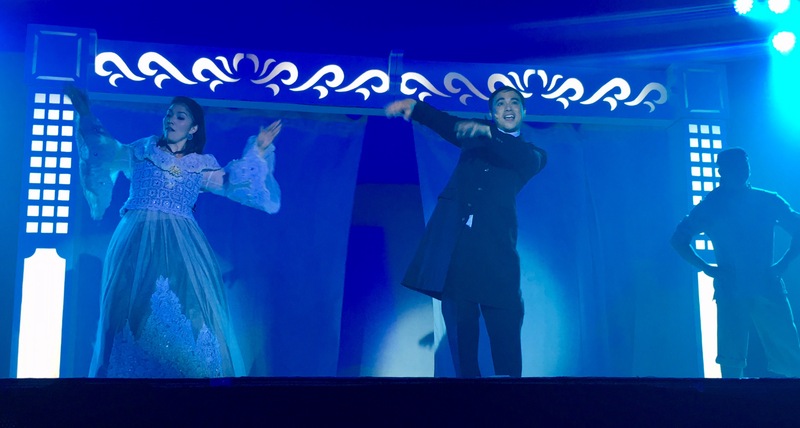 We learned of Gantimpala Theater Foundation’s staging of the four literary Filipino classics, namely Ibong Adarna, Florante at Laura, Noli Me Tangere, and El Filibusterismo a couple months ago. Since we have an 8th grader, who has started reading novels, such as Wuthering Heights, Jane Eyre, A Tale of Two Cities, and the like, not to mention she has Ibong Adarna and Florante at Laura as part of her Filipino reading materials for 7th and 8th grade respectively, my husband and I deemed it proper to watch those plays not only for her to appreciate more these great Filipino classics, but also our culture and values too. Last August, we watched Florante at Laura, and it had been a fun and enlightening activity for my daughters and me. It was their first time to watch a Tagalog play, and though it wasn’t exactly for kids, it was wholesome enough for them to watch. On September 17, we trooped back to SM Southmall, this time to watch Gantimpala Theater Foundation’s last staging of #Kanser2017 or Noli Me Tangere for the season. #Kanser2017 opened with an upbeat pop song that I wasn’t familiar with. I guess that somehow made me feel a little old. Mind you, I have a teenager at home, but she tends to listen more to classical music and soundtracks of movies that she liked or has watched recently. At the moment, she has this obsession with De Bussy’s Clair de Lune and Bella’s Lullaby on Spotify. Guess what was the last book she read that wasn’t a classic? Anyway, judging by the opening music, I should have known that #Kanser2017 would take a modern approach to presenting Noli Me Tangere. And, boy, was I in for a surprise! I have noticed that some of the actors in #Kanser2017 were also present in Florante at Laura. For one, award-winning theater actor and director Paul Jake Paule, who played Florante was Elias in #Kanser20107. This only made me respect him more as an artist, given the fact that he must be rehearsing for two different roles at the same time, i.e., one as lead and the other as supporting character, and was still able to deliver a remarkable performance on both plays. Aside from his character, Elias, Sisa, Crispin, Basilio, and Pilosopo Tasyo were among our favorites. Sisa had this haunting singing voice. I must admit that I had wondered how she would deliver the line, “Crispin, Basilio, nasaan kayo, mga anak?” which is always portrayed in an overly dramatic manner that we tend to see on talent shows on TV. I actually waited for her to utter those words then start laughing like a lunatic, but she didn’t. However, the way she sang her heart out in search of her missing children, left me teary-eyed. I felt her pain as a mother. And for some reason, images of recent news articles I’ve seen online of grieving mothers, whose teenage sons had been shot dead by the police because of their alleged involvement in drugs started crowding my mind as she sang. Truly, our society is afflicted with cancer and the staging of this play couldn’t have been more timely. The young boys who played the roles of Crispin and Basilio did really well, too. The scene that unfolded before my eyes looked so real, especially when it was just the two of them onstage, talking to each other. They didn’t seem like they were acting at all. And, when they sang together, I just had goosebumps. They literally sang as one, in an angelic voice, and it was rather impossible to tell their voices apart. The actor who played the young rector, Padre Salvi, appeared to be the crowd favorite though, especially among the female high school students. Although he was an antagonist, the kids didn’t seem to see him that way, judging by the way they acknowledged his presence onstage. He’s a fine young actor, I’d say; my only complaint was his makeup. What’s with the heavy contour shade, when he’s not even fat and has such a young face? I suppose it’s to help make him look sinister, but his makeup tends to distract the audience, or at least my niece and me. Speaking of makeup, Donya Victorina’s was a little exaggerated, with a clump of thick round pink blush on each cheek. No complaints here though, as it suited her character well and seeing her was a guarantee that she’s bound to say or do something really funny–something I realized I had come to look forward to as the story continued to unfold. Contrary to how Padre Damaso was usually perceived as a big, old, fat, pompous Spanish priest, the actor who played his character was rather young and slim. Nevertheless, he played his part well, his presence becoming synonymous to animosity the more his character lingered onstage. 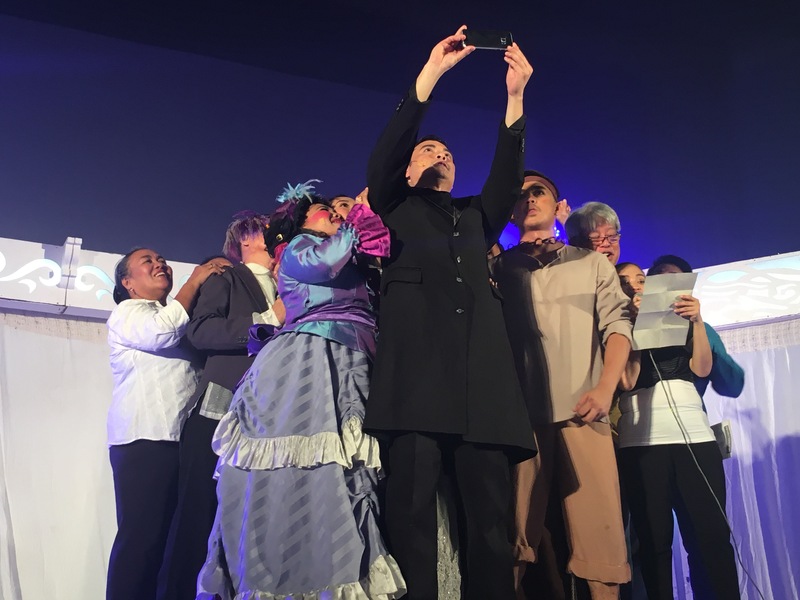 All in all, I think the actors did a remarkable performance in bringing one of Dr. Jose Rizal’s well-loved novels back to life. The writer and director certainly tried to make it appealing and entertaining for the younger generation by using words and gestures that the young audiences are familiar with these days. However, there was one scene that really disturbed me, even after the play, and regardless of how well the actors Ibarra and Maria delivered their lines. While it might have been possible for Crisostomo Ibarra and Maria Clara to have kissed passionately when the former secretly visited the latter in her room one evening to say goodbye, I don’t think it was proper at all to portray this onstage with young audiences. They could have just embraced tightly and Crisostomo could have just planted a soft fleeting kiss on Maria Clara’s lips, forehead, or cheek, instead of doing French kiss with her that seemed to have lasted for minutes. Honestly, I could not bear to tell it to my husband that I just let our 11- and 13-year old daughters, as well as my 19-year old niece, witness such a scene front row, regardless of the awkward silence that fell among the audience while it was happening. If anything, I was glad those students also didn’t seem to think that French kissing was something they should get used to seeing. But then, what if not everyone actually felt disgusted, but some were actually encouraged to think that it’s okay to do such thing? I felt compelled to stand up then and recite, “Daughters of Jerusalem, I charge you: Do not arouse or awaken love until it so desires!” from the Song of Solomon. Yes, I am one to preach because I’ve done stupid things in the past that compromised my purity and I felt horribly sorry for, even years after I was already married, despite my husband’s love, acceptance, and loyalty to me. Besides, Florante at Laura was able to portray romantic love and give its audience kilig without going through such lengths. Why did the writer and director of #Kanser2017 even think of including that in the story? Why couldn’t they just let Maria Clara be the woman who’s compassionate, sensitive, modest, beautiful, honest, pure, yet with a strong will and a mind of her own that we have all perceived? I truly did not understand the point, if there is one at all. I wonder if those kids would even tell their parents what they had seen and how their parents would react if they found out about it. Once more, I am glad that I am homeschooling my daughters and I was there when it happened. After watching the play, we discussed the story, the characters, the things that we saw onstage, the similarities between the plot of Noli Me Tangere and the current events in the society, what we liked and least liked about it, etc. over cheeseburgers, fries, Coke, and sundaes at McDonald’s. I must add, by the way, that the narrator did a good job at explaining to the students what corruption looks like in everyday life, how it is manifested both at home and in school. He also lectured about proper behavior inside the theater before the play started, but it’s just sad that he missed telling the young audience not to put their feet up on the seats in front of them. Unfortunately, a girl did just that and not only did she not realize that it was wrong, but that she had smelly feet too. Oh, come on, parents and teachers! That’s common courtesy that these kids should have learned long before they started walking on their own two feet, don’t you think? I wonder if there will also be a play on good manners and right conduct… Would they consider turning Urbana at Felisa into a stage play, too? Anyway, I can’t wait to see the colorful Adarna bird hear its lovely singing voice next month! Hopefully, we’ll have a much more fun theater experience then.